Since Kelly became Oregon’s offensive coordinator in 2007 and its head coach in 2009, the incredible statistics and daunting record rolled up by the Ducks has been largely credited to Kelly’s famed spread offense. This season Oregon is 10-0, fourth in the country in rushing, second in total yards, and first in scoring with more than 54 points per game. The most common explanation for this success is Kelly’s up-tempo, no-huddle approach and the theory that simply running plays quickly is what transforms a good offense into a great one. There’s an element of truth to this — the no-huddle is undeniably key to Oregon’s identity — but the explanation is incomplete. Oregon doesn’t use its fastest tempo all the time, and the benefits of the no-huddle go well beyond those 60 electrifying minutes on Saturdays. Kelly’s anecdote about his old high school team suggests another possibility. Chip Kelly’s offense works not because it’s a gimmick, but because rather than choose sides between old and new, Kelly’s teams straddle history. Oregon is successful because it does well what good teams have always done well, albeit with a slightly more modern wardrobe. “We spread the defense so they will declare their defensive look for the offensive linemen,” Kelly explained at that same clinic. “The more offensive personnel we put in the box, the more defenders the defense will put in there, and it becomes a cluttered mess.” Twenty years ago, Kelly’s high school coach ran the unbalanced, two–tight end power-I, so he could execute old-school, fundamental football and run the ball down his opponent’s throat. Today, Kelly spreads the defense and operates out of an up-tempo no-huddle so he can do the exact same thing. Every coach has to ask himself the same question: ‘What do you want to be? '” Kelly said at a recent clinic. “That is the great thing about football. You can be anything you want. You can be a spread team, I-formation team, power team, wing-T team, option team, or wishbone team. You can be anything you want, but you have to define it.” That definition is evident in Oregon. Kelly’s choice of a no-huddle spread offense drips from every corner of the impressive practice facilities in Eugene. Oregon does not run a no-huddle offense so much as they are a no-huddle program. For all of the hype surrounding Oregon games, Oregon practices might be even better. Oregon practices are filled with blaring music and players sprinting from drill to drill. Coaches interact with players primarily through whistles, air horns, and semi-communicative grunts. Operating under the constraint of NCAA-imposed practice time limits, Kelly’s sessions are designed around one thing: maximizing time. Kelly’s solution is simple: The practice field is for repetitions. Traditional “coaching” — correcting mistakes, showing a player how to step one way or another, or lecturing on this or that football topic — is better served in the film room. The up-tempo, no-huddle offense ends up benefiting in practice as much as it does in games. Without time wasted huddling, players get many more practice repetitions, leading to increased efficiency on Saturdays. As Sam Snead once said, “practice is putting brains in your muscles,” and Oregon’s up-tempo practices are all about making Kelly’s system second nature. When the games do begin, there’s no question that the no-huddle makes Oregon’s attack more dangerous, but it’s a common misconception that they have only one supersonic speed. 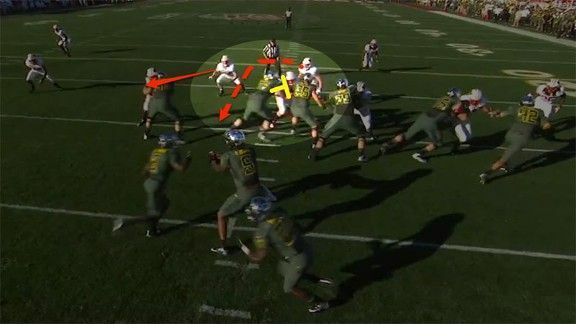 The Ducks use plenty of their superfast tempo, but they actually have three settings: red light (slow, quarterback looks to sideline for guidance while the coach can signal in a new play), yellow light (medium speed, quarterback calls the play and can make his own audibles at the line, including various check-with-me plays), and green light (superfast). This change of pace is actually how Oregon constantly keeps defenses off balance. If they only went one pace the entire game the offense would actually be easier to defend. When the defense lines up quickly and is set, Kelly takes his time and picks the perfect play. When the defense is desperate to substitute or identify Oregon’s formation, the Ducks sprint to the line and rip off two, three, or four plays in a row — and it rarely takes more than that for them to score. While the coach-player interaction may be limited during Kelly’s practices, it’s significant before and after them, mostly in the teaching of scheme. At its most fundamental, Kelly’s system is a carefully organized, carefully practiced method for forcing defenses to defend the whole field, and then exploiting those areas left exposed. And the first tool Kelly uses is a surprising one: math. As Vanderbilt’s excellent offensive line coach, Herb Hand, recently told me, “I tell my offensive line that if the defense plays two safeties deep, it’s like spitting in your face — it’s a lack of respect for your run game.” Oregon’s run game doesn’t suffer from any lack of respect; as a result, they rarely face two-deep defenses except on obvious passing downs. When a team brings that extra defender into the box, the calculus for the offense changes. “If the defense has one high safety and six defenders in the box, the quarterback has to be involved in the play,” Kelly explained. “He has to read one of the defenders, in effect blocking him. We can block five defenders and read the sixth one.” Marcus Mariota, Oregon’s dynamic freshman quarterback, has been an excellent blocker without hitting anyone at all. In the Rose Bowl last season against Wisconsin, De’Anthony Thomas, a.k.a. “the Black Mamba,” ripped off a 91-yard touchdown run to end the first quarter while showcasing explosive speed that left a very good Wisconsin defense in the dust.2 Yet Thomas’s blazing run might have been the least interesting element of the play. 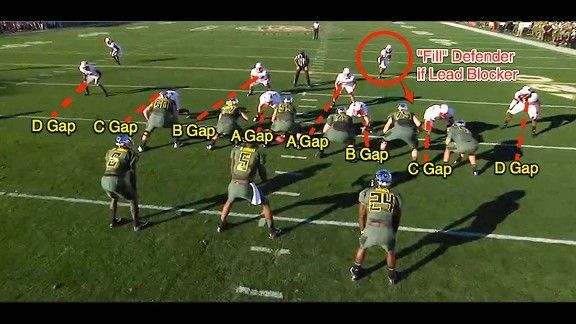 Most modern defenses employ “gap control,” meaning that they assign a defender the responsibility to fill a certain space between offensive linemen. If the defense successfully fills this space, they will “spill” a runner to the outside — right into oncoming defenders. By alignment, Wisconsin had all of the gaps covered. The problem was that because Oregon had two backs in the backfield — Thomas and Kenjon Barner — the defense needed an additional defender to account for the gap a lead blocker can “create” when a runner goes to either side of him. By walking a safety down into the box, Wisconsin had accounted for this too. Against a traditional offense, the Badgers’ defense was sound. Chip Kelly’s scheme is not traditional, and one of the areas where Kelly is a master is in messing with a defense’s efforts at gap control. 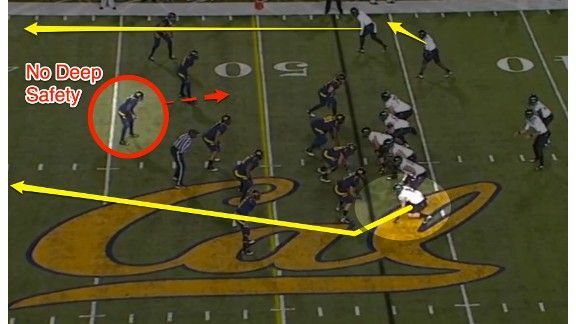 Coaches have long used a variety of methods to manipulate a defense’s keys and assignments (Jim Harbaugh is an example of a non-spread offense coach who has always done an excellent job of this, both at Stanford and now with the 49ers), from using unbalanced sets to extra tight ends to lead-blocking fullbacks and pulling linemen who can “remove” and “add” gaps that must be defended. Kelly uses those tactics, too, and they’re blended into a mix of deadly spread concepts and old-fashioned, excellent blocking. On the play against Wisconsin, Kelly packaged an inside zone running play with a “zone read triple option” to the backside. 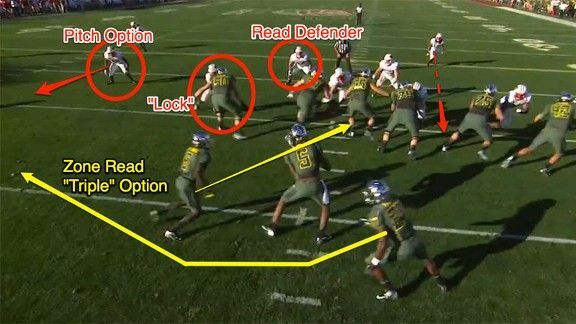 With the option, the quarterback’s job is to read the backside linebacker. If the linebacker stays put, the quarterback hands it off to a running back. If the linebacker crashes toward the back, the quarterback keeps the ball and takes it outside. And if after keeping the ball the quarterback is threatened by another defender, he has the option to pitch the ball to another running back running behind him. The idea was to mess with that carefully calibrated gap-control defense and set up the thing Kelly really wants to do, the same thing his old high school coach wanted to do — run the ball right up the gut. Wisconsin’s linebackers reacted to the backfield action by flying outside to take the quarterback and the pitch. This made it an easy “give” to the running back, Thomas. Now look at the left guard, Carson York. York (who was injured early this season and is out for the year) executed his zone blocking techniques perfectly. He first stepped to the play side to help his center block the defensive tackle. Seeing this, Wisconsin’s linebacker tried to scrape over the top to plug the open gap to York’s left and cut off the lane for Thomas. There are some defenses &#8212 like Cal’s last weekend — that decide the best way of slowing down the Ducks is by completely selling out to defend the run. Kelly has an answer for this, too. As he has explained, “If there are seven defenders in the box, there are only four defenders to play the pass. It is difficult to play man-to-man without help all day long.” The first thing Kelly does if a defense entirely loads the box for the run is to recall the lesson he (indirectly) learned from his old high school coach — make the defense cover the spread receivers, typically by throwing them quick passes and screens. Once the easy passes have stretched the defense, Kelly is then able to beat it deep. He’s killed Southern Cal as of late by using the four-verticals passing play once the Trojans’ safeties have started flying up to stuff the run. Cal had a bit more success against Oregon recently while stacking the line and playing man coverage, but they also hadn’t played against Mariota. After Oregon rushed for more than 400 yards against Southern Cal a week earlier, the freshman quarterback shredded the Cal defense for 377 passing yards and six touchdowns. One of the game’s telling throws was on a strike down the middle to dynamic sophomore tight end Colt Lyerla. 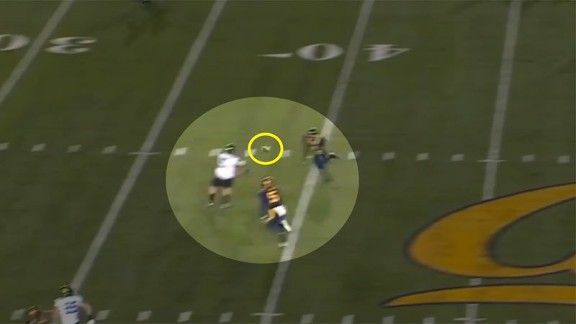 With the safeties up and a play-action fake in the backfield, Lyerla simply ran by Cal’s defense, and it was another reminder that there is not an inch of the field that Chip Kelly doesn’t make you defend. If Oregon wins the BCS title this year — they are my pick to do so, though they have suffered a number of tough injuries on defense — I’m certain that Chip Kelly will be coaching next season in the NFL. Those who know Kelly well say it’s “inevitable,” and his name, along with his friend Jon Gruden’s, will be at the top of nearly every NFL coaching search. But despite all his success, there are those who still like to label his offense a gimmick, or, more practically, wonder if it’s possible to run a spread offense in the NFL, given the beating a quarterback might endure. The numbers back him up. Marcus Mariota is third on Oregon’s team in rushing, but he’s far, far behind Barner and Thomas. In 2011, the Ducks finished the year fifth in the nation in rushing yards per game and ended with more than 4,000 on the year. Only 206 of those came from quarterback Darron Thomas. Compare that with Tebow, who led Florida in rushing yards and rushing touchdowns in each of the three seasons he was the starting quarterback in Urban Meyer’s spread-option offense. Time will undoubtedly tell whether Kelly’s offense can work in the NFL, but my vote is that it will. It would require Kelly finding the right players, but a Chip Kelly–coached NFL team would win for the same reasons that the Chip Kelly–coached college team wins. Behind the speed, the spread, the Daft Punk helmets, and the flashy uniforms, Oregon ultimately wins with old-fashioned, fundamental, run-it-up-the-gut football. I think everyone, even fans of the spread offense, can appreciate that. Kelly’s running game consists of only a handful of plays dressed up with a variety of disguises. As of the 2008 season, he had roughly four blocking schemes — inside zone, outside zone, counter, and a draw play — but has expanded in recent years to include newer concepts, such as a sweep read with pulling linemen. The best way to keep up on Kelly’s innovations is to check out FishDuck. These guys — who are mostly Oregon fans, but get some help from coaches — do an excellent job chronicling the variations Kelly introduces in his offense. I normally don’t like nicknames, but Thomas is really good, and his nickname was given to him by Snoop Dogg, when Thomas torched the Pop Warner team that Snoop was coaching. It might be my favorite nickname story of all time. For all the attention his quarterbacks and running backs get, Kelly prefers singing the praises of his offensive linemen. “No one asks [offensive linemen] what they are willing to sacrifice because they do it all year long. That group is a unique group,” Kelly said. “They shop for clothes at True Value Hardware. The only thing they want is to change the snap count occasionally.” Kelly, who coached offensive line at New Hampshire, knows they are the foundation of his offense and his team. Students of the Indianapolis Colts this year have seen Andrew Luck effectively run zone read plays on more than one occasion.